NUCA Magazine Article, March Edition – January 19, 2015 – Construction Angels is a 501(c)(3) Non-Profit organization that provides immediate financial assistance and grief counseling to the spouse and children left behind after a construction worker has lost their life on a job site. They also offer construction safety information and resources, as well as raise awareness of construction fatalities in the United States. Statistics indicates that 796 construction workers lost their lives in the US while on a construction job site in 2013*. The charity has expanded rapidly in the state of Florida since they began their missionin June 2011. Their success in assisting families throughout Florida has led them to expand into Georgia and Ohio in 2015. Construction Angels relies primarily on fundraisers, associations, corporate sponsors and donations to provide assistance to these devastated families, and has been effectively gaining the support of local and national construction associations, companies and corporate sponsorships. “These men and women work hard to provide for their families while building our homes, roads, bridges and places to work across the US. Many of the families we have assisted over the years live paycheck to paycheck without any financial planning in place for their families. Their financial and emotional struggles begin immediately, and Construction Angels are so happy to make a difference these families’ lives with support and grief counselling,” said Kristi Ronyak, President & Founder of Construction Angels, Inc.
“We are extremely appreciative of the recognition that NUCA has given Construction Angles and the opportunity to bring more attention to the charity. Construction Angels hopes one day to work together with NUCA Chapters on a national level throughout the US. NUCA has offered to provide us with a booth at their 2015 Convention, so please stop by and introduce yourself. Our charity will provide information and discuss topics with attendees that relate to the safety and fatalities within our construction industry,” said Ronyak. Visit their website www.constructionangels.us for additional information about the organization and upcoming events in your area. 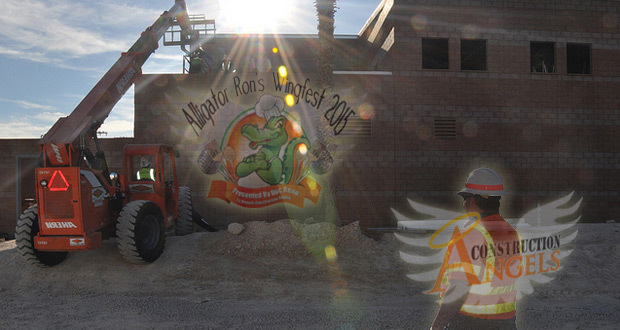 You can register for sponsorships and purchase tickets for Alligator Ron’s Wingfest under the Events Tab, or by visiting www.alligatorronswingfest.com. All donations are tax-deductible. For more information contact Kristi Ronyak, President & Founder of Construction Angels, Inc directly at 754-300-7220 office, Kristi.Ronyak@ConstructionAngels.us or Sharon Dressler, Director of Construction Angels, Inc at 954-260-6164 cellular, sdressler@mail.thebluebook.com.